Ramakrishna Mission, Delhi conducted a three day State Level Youth Convention with the theme ‘Awakening the Youth Power’ from 18th October to 20th October 2013. On the third day (20 Oct 2013), on the session titled ‘Success Mantra for the Youth (युवाओं के लिए सफलता के मंत्र)‘, Swami Srikantananda spoke on ‘How is true success defined (युवाओं के लिए सफलता के मंत्र)’. 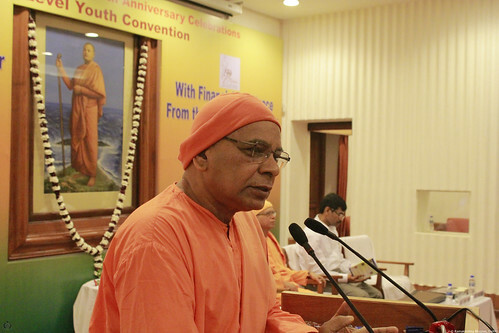 Swami Srikantananda joined the Ramakrishna Order in 1982 and served at the Ramakrishna Math, Hyderabad from 1987 to 2009 during which time he was also the director of the Vivekananda Institute of Languages and Vivekananda Institute of Human Excellence. He is currently the Head of Ramakrishna Math, Pune. He has composed many Hindi and Marathi songs on Sri Ramakrishna, Sri Sarada Devi and Swami Vivekananda and is also the author of several books in English and Marathi.